How to sign out from Kindle for PC? Sign out from Kindle for PC is called "Deregister Kindle for PC". Deregister the Kindle for PC app from your Amazon account if it is registered to the wrong account or if you no longer want to use it to purchase Kindle books. 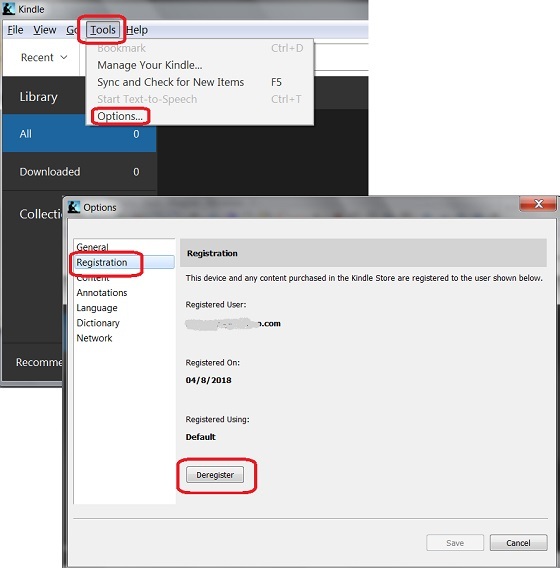 To deregister the Kindle for PC app, your computer must be connected to the Internet. If your Kindle app is registered to the wrong account, deregister the app, and then register it to your account. 1. From the top navigation, click Tools, click Options, and then click Registration. 2. Click Deregister. After you deregister your Kindle app, many features will not work. After deregistering, you can register your Kindle app to another Amazon account.